Small maelstrom. Photo by Shutnic. When you hear a name like maelstrom, you just know it’s about something wicked. Introduced in English by Edgar Allan Poe from the Nordic languages, from which it came from the Dutch word maelstrom (maalstroom in modern spelling), it literally means crushing current, which is quite a very good description. 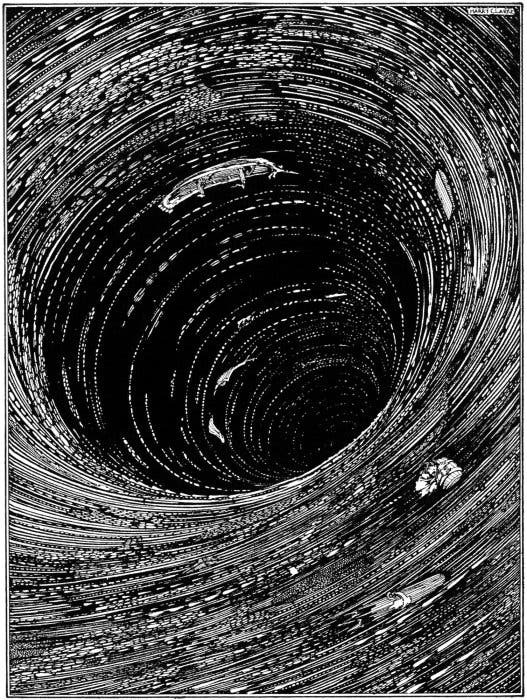 Illustration for Edgar Allan Poe’s story “Descent into the Maelstrom” by Harry Clarke (1889–1931), published in 1919. A maelstom is basically a very big and powerful whirlpool, a free vortex; a free vortex with quite a downdraft. The original maelstrom was Moskstraumen, which is caused by a very powerful tidal current. Both Poe and Jules Verne depict it as a giant vortex that leads to the bottom of the ocean where it is in fact a crossroad of underwater currents. Well.. they were a bit off, but still, it’s quite a view to catch. Photo by dalasher1, via deviantart. 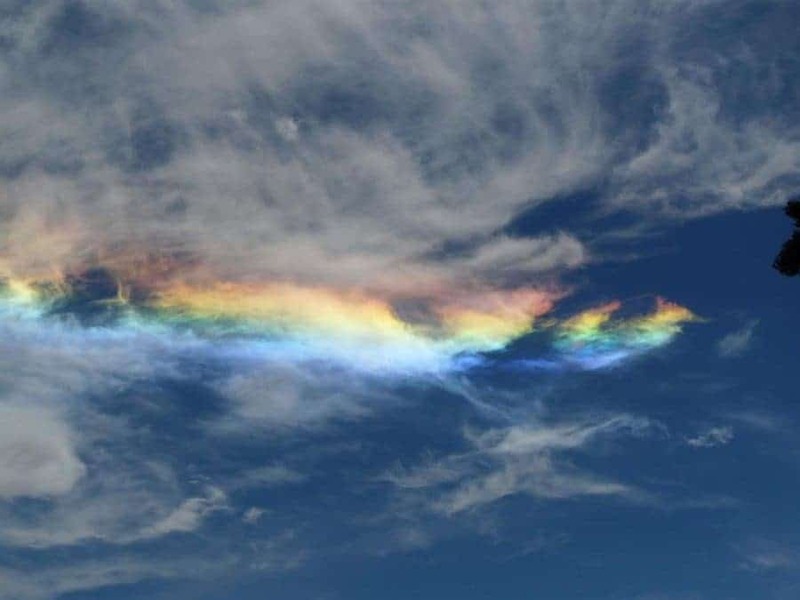 The term ‘fire rainbow‘ is really misleading; the correct term is circumhorizon arc. It’s basically an ice halo formed by ice crystals located very high, in the cirrus clouds. This huge flamboyant lovely display of colors is really not as rare as you might think, and how often it appears depends mostly on location, and especially latitude. For example, in the US it can be seen several times a summer in each year in the same place, but in Central or Northern Europe it’s very rare. 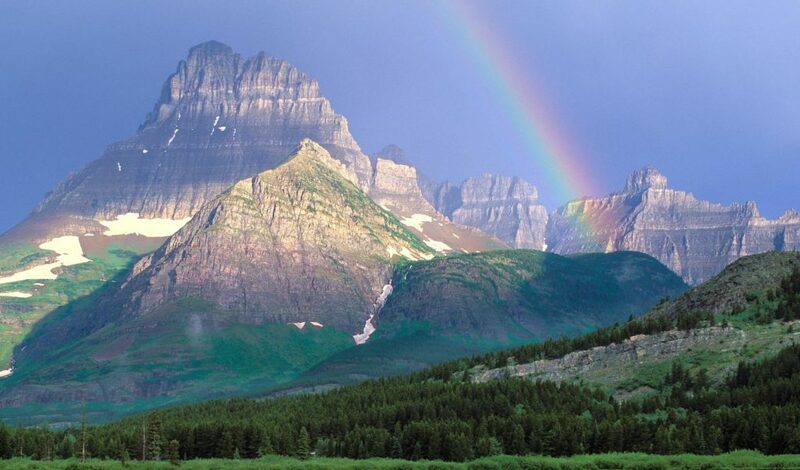 Of course, this rainbow is not formed the way ‘classic’ rainbows are formed. Light passes through the hexagonal ice crystals via a vertical side and leaves through the nearest horizontal bottom face. 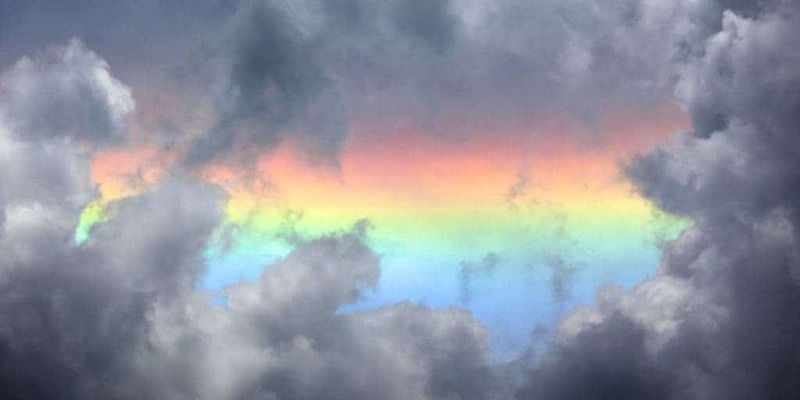 If there alignment is just right, it makes the whole cloud shine rainbow-colored. A waterspout near Florida. The two flares with smoke trails are for indicating wind direction and general speed near the bottom of the photograph. Photo by NOAA. Waterspouts seem to be taken out of the Captain Planet series. You know, earth, wind, fire, all that? Well, here it’s all about wind and water actually, because a waterspout is in fact a really intense columnar vortex that takes place over a mass of water and links it to a cumuliform cloud. Most of the time, they are weaker than land tornadoes, but some are extremely big and bring the water upward with immense speed and power. They can actually be tornadic or non-tornadic. The non-tornadic ones are way more common and less dangerous with winds being slower than 70 mph (30 m/s). 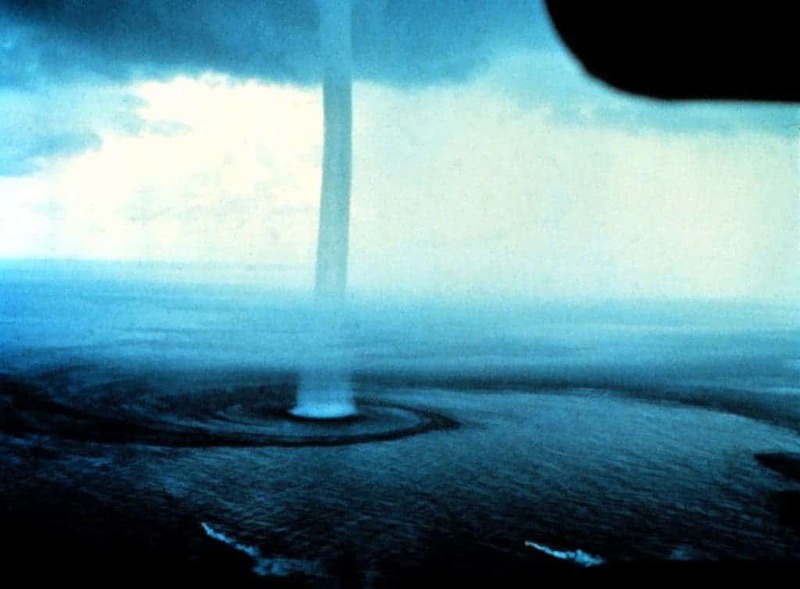 Tornadic waterspouts are similar at their core to a tornado, but they add huge masses of water to the show, making it a scenery hard to forget. The even rarer ‘cousin’ of the waterspout is the snowspout (or icespout). 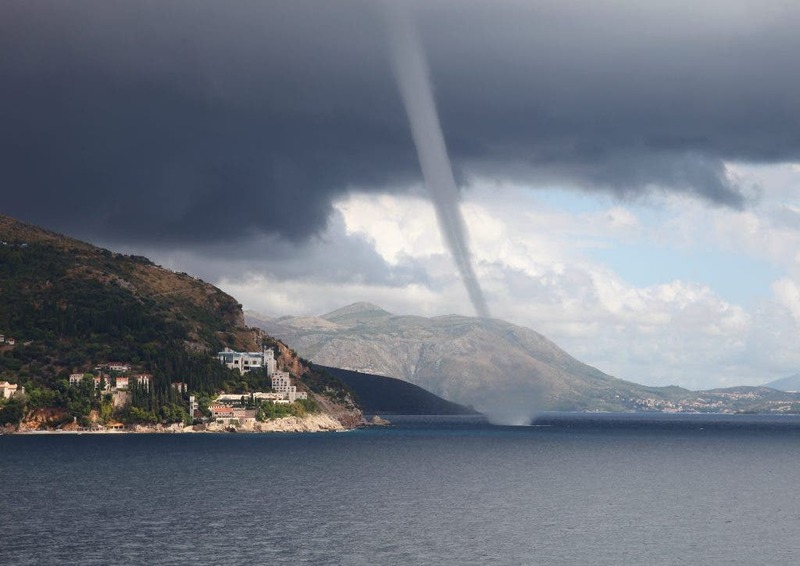 They are basically a very rare form of waterspouts that form at the base of a snow squall. There have only been six (!) 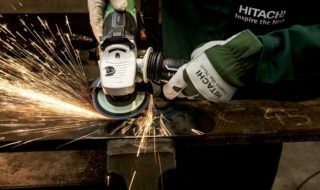 pictures taken of such an event, so there’s not really much we can give you here. Oh this one’s good. We’ve all probably heard about this in one form of another, but most just chalk it up to folklore. Well, this isn’t the case! The department of Yoro is host of one of the most bizarre and amazing phenomena to ever take place: the rain of fish, that takes place every year for more than a century now. Each year, between the months of May and July a dark clouds appears in the sky, followed by a massive thunderstorm, it rains a lot, the whole nine yards. It all lasts 2-3 hours, at the end of which people go out on the street where they find hundreds of living fish on the ground; yeah, they eat them. There aren’t any clear conclusions, but a theory that’s accepted sometimes is that the strong winds and waterspouts take the fish from 200 km away. However, a significant number of scientists claim they are not sea water fish, but fresh water fish that swim from a nearby river to an underwater current, and some fish stray from the current and appear on the ground. But here’s the good part: National Geographic sent a team to investigate this, and they found that the fish aren’t found in any surrounding bodies of water, and also they’re all blind, so they came up with their own theory: they live in underground rivers, because they are blind. Anyway, if you ever visit Honduras in the summer, this is something you really should see. We’ve all (probably) seen rainbows, at day. But how many of us have seen rainbows at night? Yeah, this can actually happen, due to the light produced by the moon (thus moonbow, or lunar rainbow or white rainbow). Of course the light emitted by the moon is much much fainter than that of the sun, so as a result, so is the formed rainbow; most of the time, it’s even hard for the human eye to separate the colors there. Photograph of a spray-induced moonbow (lunar rainbow). Photo by Calvin Bradshaw. 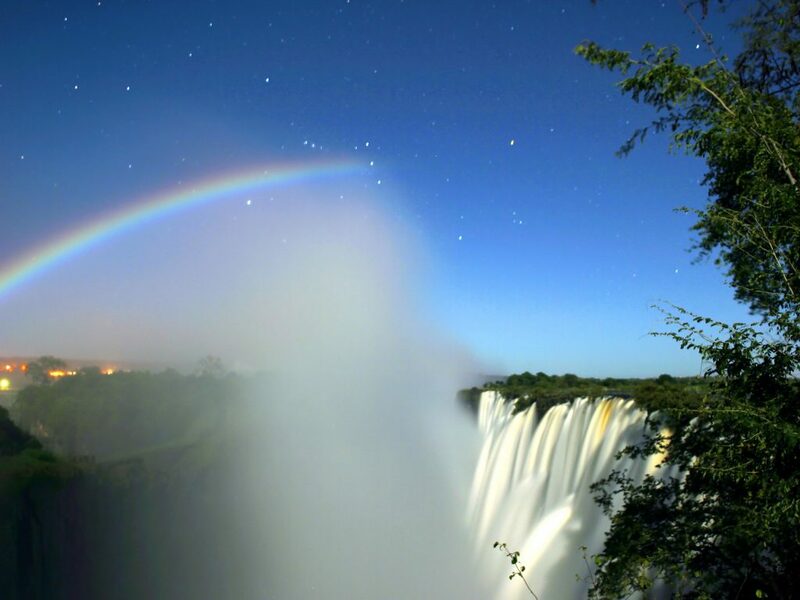 The biggest chance you have of ever seeing a moonbow is when the moon is full (or near to full), when it’s the brightest, but there are other conditions required. The sky has to be very dark (close to black), and, of course, there must bee rain falling opposite to the moon. 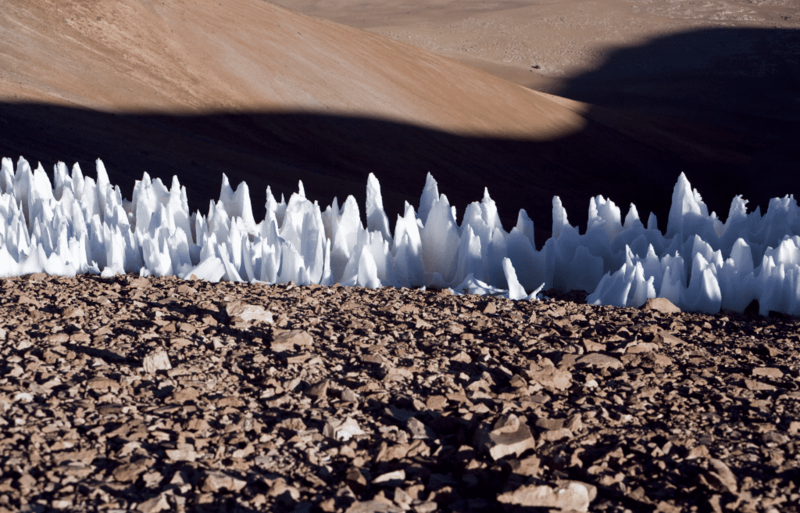 These sharp ice spikes can only be found at high altitudes. 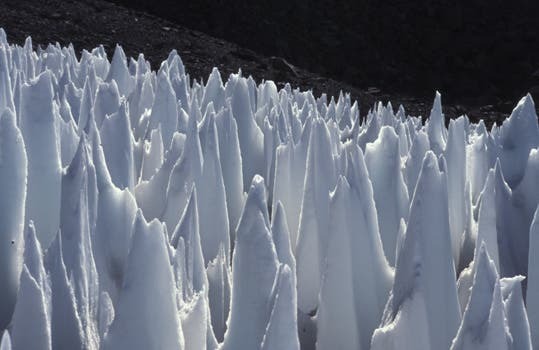 Ice (or snow) formations that take the form of blades or spikes varying from a few centimeters to 2 meters (or even more) have fascinated researchers since Darwin’s time, as he was the first to ever describe them. He had to squeeze his way through such a field and was the first to notice they generally follow the direction of the sun? But how are they formed? The mechanism of their ‘birth’ is a bit complicated, and it relies on differential ablation. Basically, for penitentes to form, the dew point has to be below freezing. As a result, the snow will sublimate, which requires more energy than melting. The geometry of the surface provides a positive feedback mechanism for radiation, which is trapped by multiple reflections, creating hollows. These hollows, combined with wind that increases the dew point temperatures provide the right conditions for the sublimation to create the steep walls and peaks. 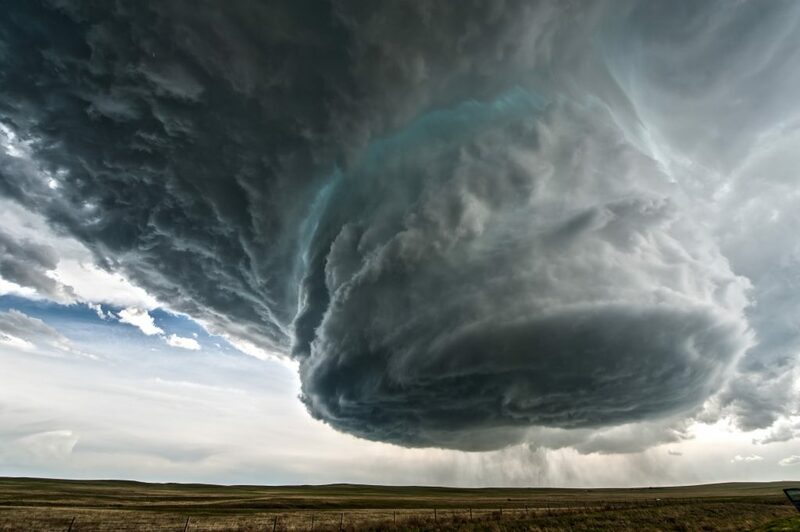 Supercells are rotating updrafts within severe thunderstorms; they’re big, and bloody scary. They can appear anywhere in the world given the right meteorological conditions, but most of the times they appear in the Great Plains of the US, last generally 2-3 hours and they sometimes split in 2, with the two resulting storms going in opposite directions. 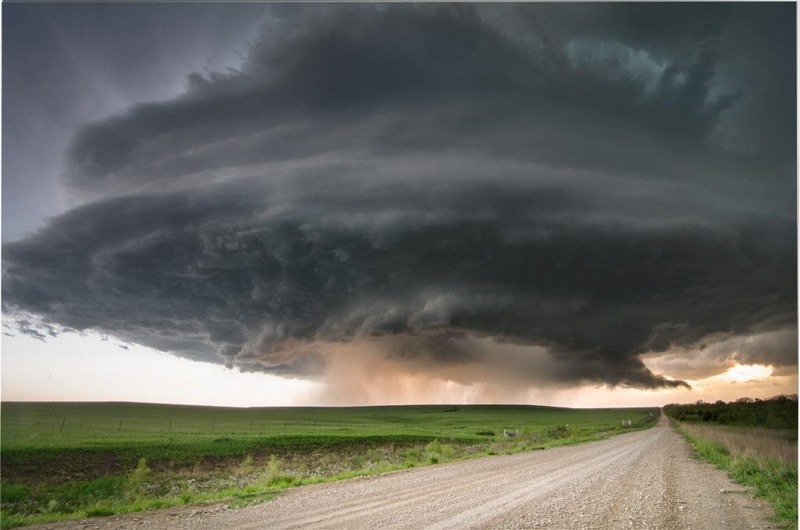 The supercells usually produce huge amounts of hail, torrential rainfall, strong winds, and substantial downbursts and they are often carriers of giant hail. There are a whole lot of technical details left to be said, but I’m not gonna stress that here (maybe in a future post), find the anatomy of a supercell here. Scientists have given quite an interest in supercells, because, as you could have guessed from the pics, they’re really dangerous. Really. 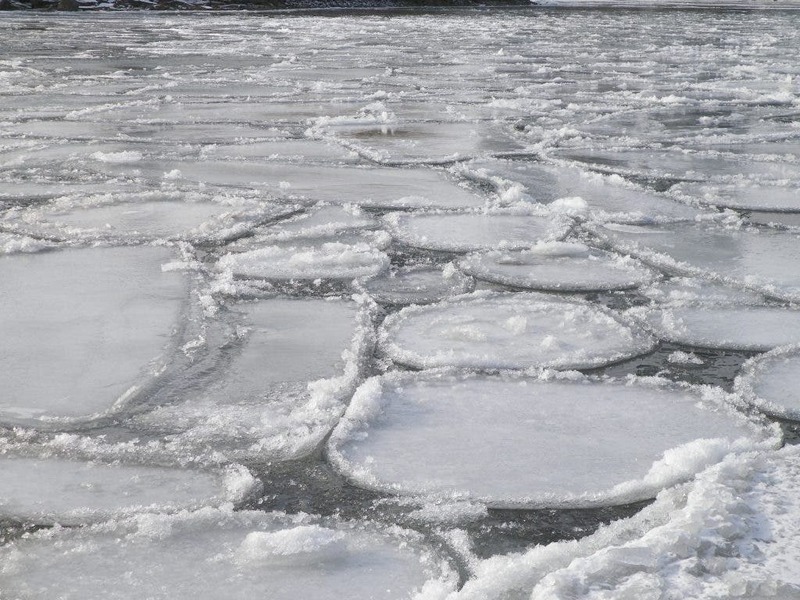 Ice Circles are pretty much what you’d expect from them. However, they’re very rare, appearing only in slow moving waters from cold climates such as Northern Europe or America, but some have also been spotted in Britain, including a huge one bigger than 3 meters. There are two types of ice circles. Here’s the general necessary conditions for the first type to form. No rain and temperatures below 0 Celsius for several days near a slow river bend. 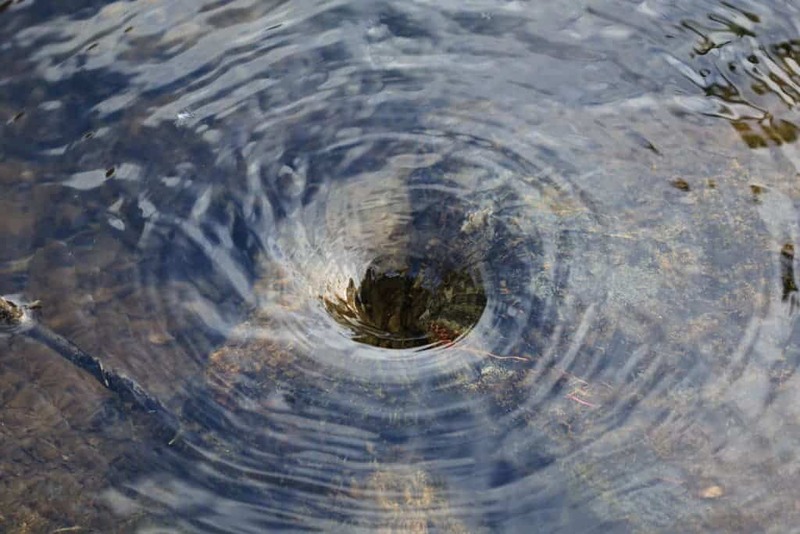 Thus, the water creates a force that is called ‘rotational shear’ and breaks a chunk of ice, twisting it around and grinding it to the surrounding ice, turning it into a perfect circle.The second type is perhaps even more spectacular. Also called ice pans, these formations are basically surface slabs of ice that form in the middle of the river, and not on its side. They’re explained by sudden shifts of temperature. 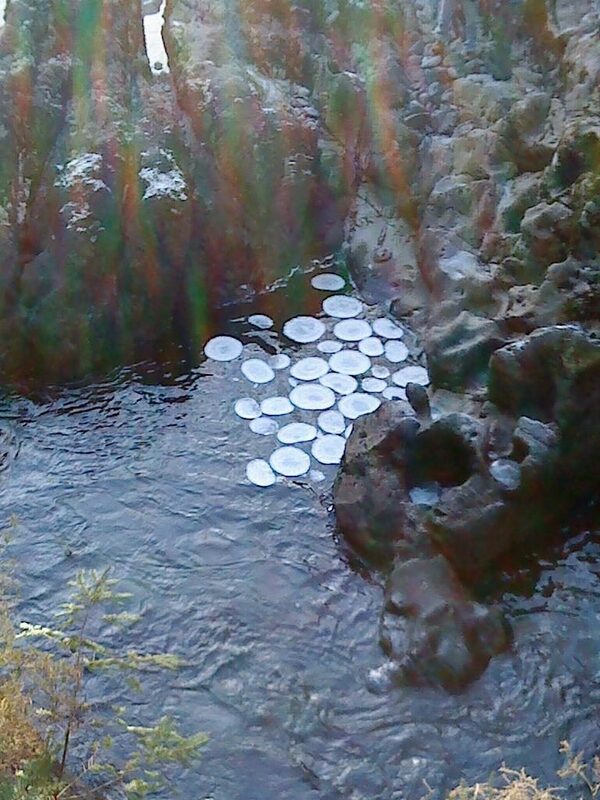 As the water cools off, it gives away heat that creates frazil ice (randomly oriented ice needles loose in the water). These ice particles can of course form an ice pan, and if the lake has enough frazil ice and the current is slow enough, the ice pan can reach the sizes that baffle people and even become a hanging dam. Of course you have to understand there are some weird or amazing phenomena that have eluded us, so if you know of something good, we would be ever grateful.